The Rag Rug Handbook provides the basics in hand weaving for the floor loom weaver. Here are projects, and step by step insructions for getting started. Included, is a chapter on the history of looms including handmade and patent looms sutable for the rug weaver. This classic resource for new and experienced rag rug weavers is updated and has a new binding. It contains a beginning rug project plus patterns for 20 rugs based on traditional desisgns for 2 and 4 harness looms. Includes: Rag preparation, rug design, warping information, rag rug supplies, bibliography, weaving and finishing hints, antique loom information and glossary.To Order: write to Interweave Press, 201 East Fourth Street, Loveland, Co. 80537. Call them toll-free at 1-800-272-2193. Or go to the Interweave Press Website. This book is an ABSOLUTE MUST for a rag rug weaver. It is the best book I've found yet that describes not only the art of weaving rag rugs but also tries to give an historical account of looms that were made. I used this book as a reference when I bought an used loom. Since the labeling was missing on the loom, the previous owner could not identify what kind of loom she was selling. I was able to not only identify the loom, but I knew from this book that the type of loom I bought was appropriate for rag rug weaving. If you want to learn rag rug weaving, this is the book to get! Paula and Janet did well with this book. I am a novice rug weaver and found the directions to be easy to follow and the results pleasing. Definitely buy this book if you're looking for something on weaving rag rugs! I am definitely a novice weaver. This book spells everything out very clearly, from A to Z. Plus, short history of many of the manufacturers. The patterns included will take you from simple to challenging. I have other weaving books, but this one is the one I refer to the most. 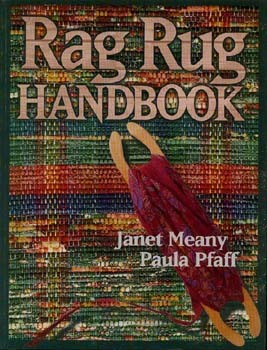 If you only buy one rag rug handbook, I recommend Janet Meany and Paula Pfaff's book.